A bittersweet coming-of-age story featuring illuminating, hypnotic photography of the Portuguese countryside amid the changing seasons, Volta à Terra is a poetic love song to traditional ways of life. Volta à Terra tells the story of an endangered community: farmers who practice subsistence farming in a mountainous village of northern Portugal, deserted due to emigration. Between the evocation of the past and their uncertain future, we follow the 49 inhabitants through four seasons. Daniel, a charismatic young farmer in northern Portugal, is dedicated to the farming methods of his forbearers. But will dreams of love take him away from his homeland? 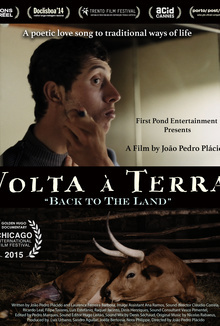 A bittersweet coming-of-age story featuring illuminating, hypnotic photography of the Portuguese countryside amid the changing seasons, Volta à Terra is a poetic love song to traditional ways of life.